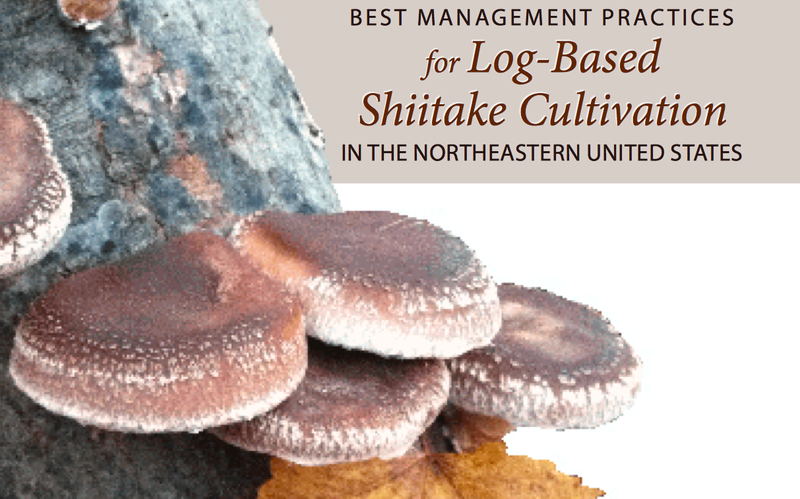 “Best Management Practices for Log-Based Shiitake Cultivation” guide produced by the University of Vermont and Cornell University outlines the best management practices and includes tips from experienced growers, data gathered from farms starting their operation, and the latest academic research. Only living and healthy trees are used. The recommended tree types are Sugar Maple, Red Oak, Ironwood, American Beech, Carpinus, Hickory, and Sweet/Black/Yellow Birch types. The usual diameter of the logs is 4-6 inches, and length is 3-4 feet. It’s preferred that the logs have more sapwood (outer ring of the tree) than heartwood (the inner part). Bark should be intact and any damaged areas are waxed over to seal in moisture and block out other fungi. Inoculation has to take place as soon as possible after the tree has been cut down, anywhere from 1 day to 3 weeks after. To start, small holes are drilled into a log in a diamond pattern about 3 inches apart (7/16″ in diameter and 1.25″ deep). Each hole is tightly packed with spawn about 1/8″ below the surface using a palm inoculator. The surface of each hole is covered with food grade wax using a wax applicator. The wax can be heated in a skillet or pot to 350-400 Farenheit degrees, and used once it starts to slightly smoke. The ends of the log are also dipped into wax or can be covered with a paint brush. The logs should be placed in an year-round shaded area, with high humidity and low wind passage, to not dry out the logs. The best place is under the canopy of a coniferous forest or behind the north side of houses or sheds. It’s important to clean up the organic debris on the ground to decrease the potential of slug damage, or even place gravel. The logs can be stacked on pallets off the ground in a variety of formations. It’s recommended to label the logs to keep track of the log species, fell dates, inoculation dates, spawn types, and force dates. Incubation called the “spawn run” is usually 8-18 months. Any log that’s completed the spawn run will fruit spontaneously. However it’s also possible to “force” the mycelium to produce mushrooms by “shocking” them. Shocking involves soaking logs in cold water in a stream or a container for 12 to 24 hours to induce fruiting. The logs can be shocked every 6 to 8 weeks after fruiting. It’s possible to use a schedule of shocking to generate a steady and predictable harvest. After retrieving the logs from cold water, they can be stacked in an A-frame leaning upright on one to two sides against a supporting beam. This stacking method works well for the fruiting and harvest stages, keeping the logs well aerated, making it easy to see and pick the mushrooms with maximum access to each log. 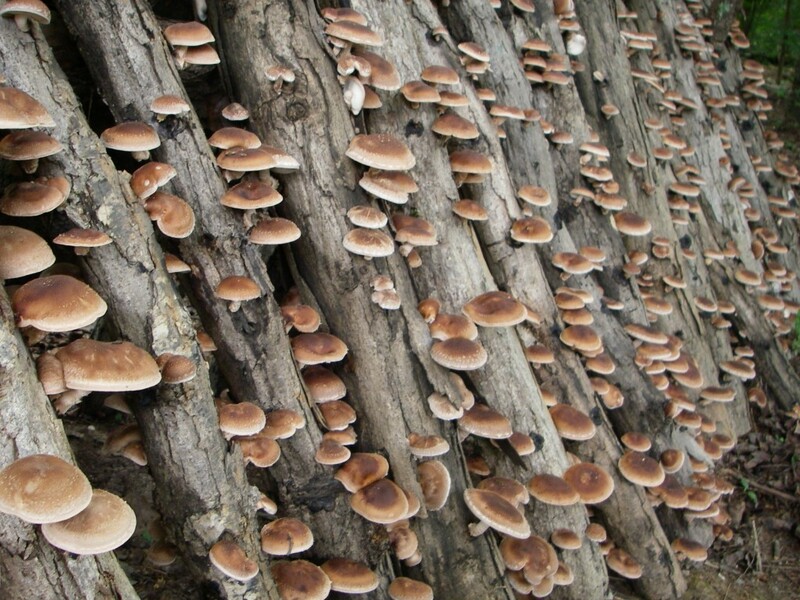 Shiitake mushrooms are usually ready to be harvested 7 to 10 days after shocking, although colder temperatures slow their growth. The mushrooms are picked depending on the growth progress rather than their size. The gills should be visible and the outer edge of the mushroom should be slightly curled under. If the edge has flattened out, the mushroom is still edible but slightly over-ripe. The mushrooms can be eaten fresh, frozen, or dried using the oven, dehydrator or simply sun-dried. More detailed instructions can be found in the “Best Management Practices” guide, as well as at the Mushroom Cultivate website at the Cornell University. The research at Cornell over the past decade has been focusing on cultivation of shiitake, lions mane, oyster, and stropharia.